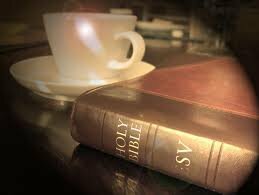 The idea and daily practice of having “Coffee with the Lord” was born out my own spiritual journey. I had wonderful parents who modeled the value of personal devotions in their lives. You would find Mom in the afternoons or evenings lying on her stomach across the bed reading her Bible and praying. On of my fondest memories of Dad was seeing him after chores on the farm with his Bible on his lap, tears running down his face as he read God’s wonderful word. Their model of devotion to time alone with the Lord deeply impressed me as a young boy! After entering high school I developed the art of “hypocrisy” – I knew how to behave like a devoted Christian on Sunday, but the rest of the week I was anything but Christlike! Christianity – following Jesus – was anything but an adventure for me… In fact, I found it downright boring! Then God brought a wonderful Christian high school teacher into the high school I attended. He’d only known the Lord for about 6 months but it was evident that following Jesus was an exciting adventure for him (and not a boring experience, like mine). One day, I just couldn’t stand it any longer… I asked him, “What is it with you? The kind of Christianity you have is not at all like mine! What do I need to do? !” His answer to me was a question that really floored me! He said, “LeRoy, how much time are you spending every day in God’s word?” I was embarrassed! I was spending almost no time at all reading and reflecting on God’s word! I accepted his challenge! I had enough credits I only had to go to high school half a day and had gotten a job at a newspaper in the afternoon. So I’d drive to work in the old ’50 Chevy my grandfather had given me, take my Bible and a pencil and spend my lunchtime in the parking lot of the newspaper office reading God’s word. I don’t have adequate words to express what happened! It was as if God was right there in that car meeting with me … that ’50 Chevy became a “temple”! I’d read, underline what I thought God was saying to me, worship and pray as tears ran down my face. It became, for me, the most significant personal “revival” I have ever experienced! That is what gave birth to “Coffee with the Lord!” I’ve been doing it now for over 50 years and what a wonderful, enriching experience it has become – A good cup of coffee, Bible reading, worship, prayer, reflection and journaling. I hate to miss a single day! It’s how I keep my spiritual reservoir full! In fact, I had coffee with Him again this morning! I know He’d have coffee with you as well!